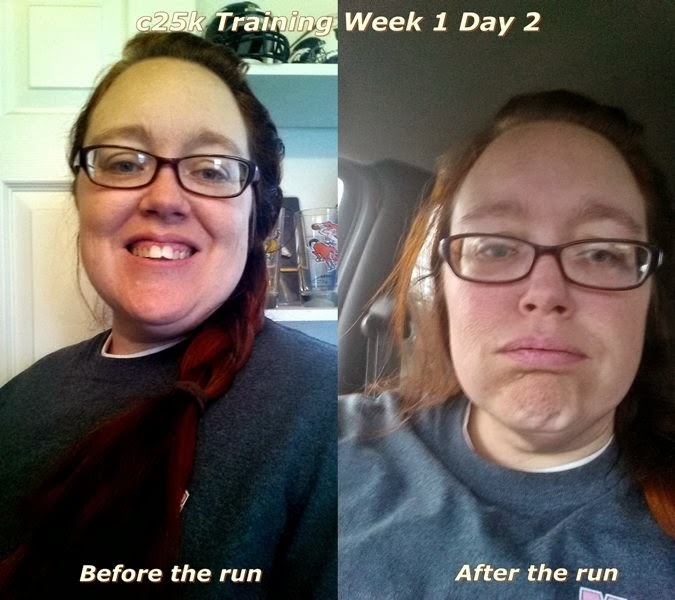 The Recovering Fat Chick: I'm a Runner! I'm a runner! Well, I'm trying to become one anyway. It has been over twenty years since I have put one foot in front of the other in the form of running, even then I hated it, and I never thought I would do that again. That being said, I came across this link one day and decided that I wanted to do this: www.runforyourlives.com. Now tell me that doesn't look like a hoot! So, how is a 37 year old morbidly obese woman supposed to run in a race like that?! Well now let me introduce you to the Couch to 5k (C25K) running plan (www.c25k.com). This plan is supposed to take a person like me from the couch to running a 5k or 30min straight in 8 weeks (I am realistic and know I probably won't be running a 5k in 30 min even at the end of 8 weeks). You are able to redo days or weeks if you need to and advance at your own pace. 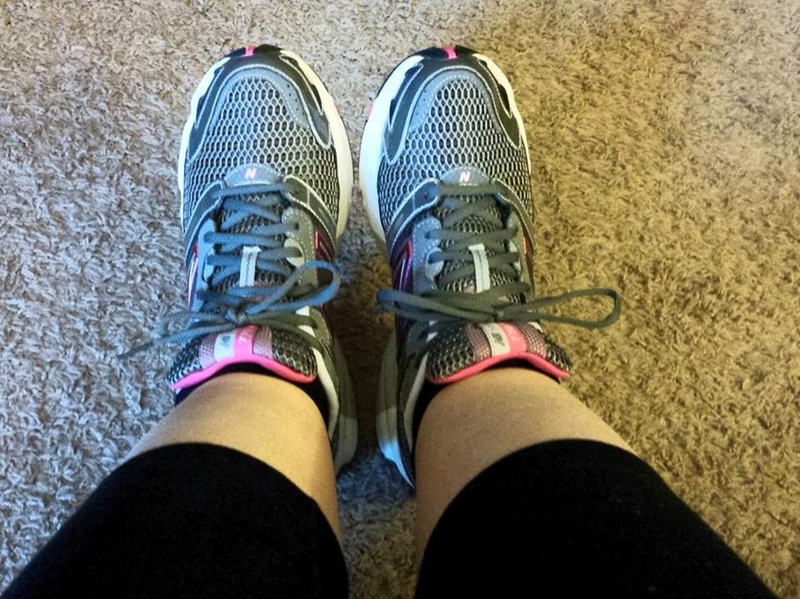 I downloaded Zen Labs C25K for the cure app on my phone to keep me on track, ordered a pair of running shoes and when they came, I was ready to go! Each week I will post my weekly running log here and hopefully it will keep me motivated and inspire someone else in my situation to get out there and move their bodies! I am excited and motivated to complete this program and maybe, just maybe, advance to the 10k program. Laced up and ready to go! Day 1 Week 1 (November 14, 2013) - Goal: Brisk 5 minute walk, alternate 60 seconds of jogging and 90 seconds of walking for 20 minutes, 5 minute walk. Before the run: Today I start with a 5 minute warm up (walking) then alternated 60 seconds of running with 90 seconds of walking. I'm pretty sure I'm going to die but, I'll give it a try. After the run: I did it! I can't believe it! I did have to stop running a few seconds early a couple of times but, I made it! I probably sounds like a winded bull and ran slower than a snail but I did it! If my husband hadn't come with me I think I would have given up. Thank you David! I just hope I don't have huge problems with my mild asthma. I am a bit wheezy and coughing after this run. Day 2 Week 1 (November 16, 2013) - Goal: Brisk 5 minute walk, alternate 60 seconds of jogging and 90 seconds of walking for 20 minutes, 5 minute walk. Before the run: Today is the same run as last time, 5 minute warm up (walking) then alternated 60 seconds of running with 90 seconds of walking. Yesterday, I was only a little bit sore from the first day. Today, I have to run again but am so sore I could barely get out of bed. These are the days I would normally quit... NOT GONNA HAPPEN! I will baby myself a little this morning but then it's off to the races (someday). After the run: Wow! That wasn't so bad! I made it through each run and feel great! I really think I'll be able to do this! We did move to the high school track because it just seemed easier to run there, and there were less distractions for our crazy dog i.e. tornado on a string. I got a pretty bad stitch in my side the first day but, the stitch was much less severe today and came later in my run. Yay! I feel so accomplished! Oh! And, no real problem with my asthma. Looks like the cold is what sets it off because it was a bit warmer today. Day 3 Week 1 (November 18, 2013) - Goal: Brisk 5 minute walk, alternate 60 seconds of jogging and 90 seconds of walking for 20 minutes, 5 minute walk. 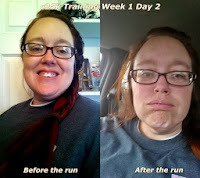 Before the run: I am very surprised that I was not extremely sore after my last run as I was for the first one. Don't get me wrong, I am still a bit sore, but it is manageable. I am also blown away that I am actually looking forward to my run this afternoon. The weather should be somewhat better than the last two days, and I get two rest days after today! I realize I might be running slower than a herd of turtles running through peanut butter but, I AM RUNNING! I don't know if I will ever get to the point that I will consider myself a true runner, but I am moving and loving what I am doing right now. Who would have ever thought I would say I love running, and it's only the beginning. After the run: I made it! I really made it! I never thought I would even be able to complete the first week without having to repeat it but I did! I was nervous today when I got to the running track because there were some teenage boys in the bleachers. I have had nasty comments made towards me before but, they didn't say anything. They watched me for a few minutes and then went on about their business. 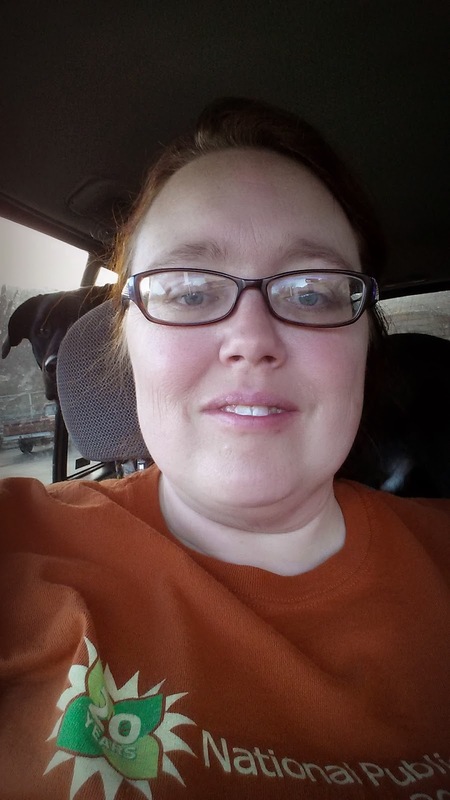 The nervousness I was feeling about being seen running is dissipating and I feel much more comfortable. I'm stoked to move on to week two. Oh my gosh that is awesome!!! 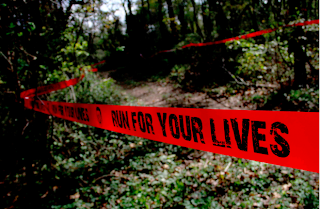 I'm a run for your life blogger. I've been a part of the race since they first came here to Texas. Due to my health I've yet to be able to run. I really want to. I've been a zombie a couple of times, I volunteer and this upcoming one next month I'm a caged Zombie. AWESOME!!!! But my goal is to one day have my doctors say I can run. Thank you for stopping by my place this morning. Thank you Amber! I'm excited to try it! You'll meet your goal and be able to run, I just know it!